A new global megaproject, unparalleled in scope and ambition, presents vast opportunities and risks for multinationals. Achieve breakthroughs by bringing together experts who love challenges. Companies can’t expect to compete if they’re not open about how and why people are compensated. Three guardrails must be in place to allow these groups to perform well within an organization. According to Adam Smith scholar Ryan Patrick Hanley, executives can navigate today’s turbulence only by learning to see themselves as others might see them. Lessons from the Chilean government’s response to crisis. Building a culture of critical thinking and humility can spare companies from the ravages of excessive CEO confidence. 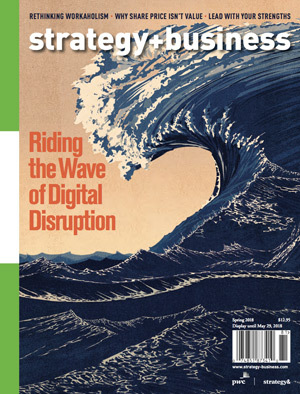 Technological changes foreshadow a dramatic — but manageable — shift in business logic everywhere. Paul Leinwand, coauthor of Strategy That Works, introduces a counterintuitive lesson in how to achieve breakthrough performance in your organization from Olympic medalist John K. Coyle. In her new book, Leslie Berlin offers a group portrait of the unsung heroes who forged iconic companies — and a new industry — in the 1970s. Can Workaholism Be Good for You? For people who put in long hours but love their jobs, a sense of fulfillment seems to offset unhealthy stress.